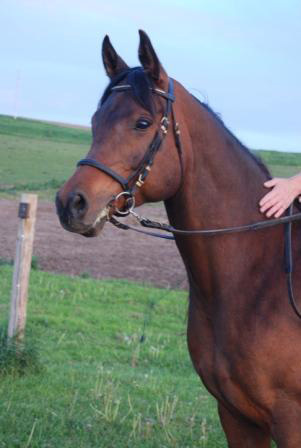 Snap hooks on reins: Do they give your horse a headache? If you are like me, you’ve come to appreciate practical things that make your interaction with your horse easier. One of those little gadgets is the ‘snap hook’ or ‘carabiner’. Friends at the barn introduced to me to the handy little hook, that allows you to attach the reins to the bit and detach them quickly if needed. This seemed to be a sensible solution and soon you could see clinicians in advertisements sporting the practical snap-hook, like the one on the image below, taken from a recent advertisement in a national equine magazine. Practical for the rider—discomfort for the horse? In his book “Sporthorse Conformation” (Kosmos Publishing, will be available in the US soon), veterinarian and certified FN trainer Christian Schacht describes the popular snap-hook as an often overlooked contributor to behavior and performance problems in horses that stem from discomfort caused by the metal on metal effect when snap-hook attaches to the metal bit. The physics of the tuning fork—pre-programmed tension headache! 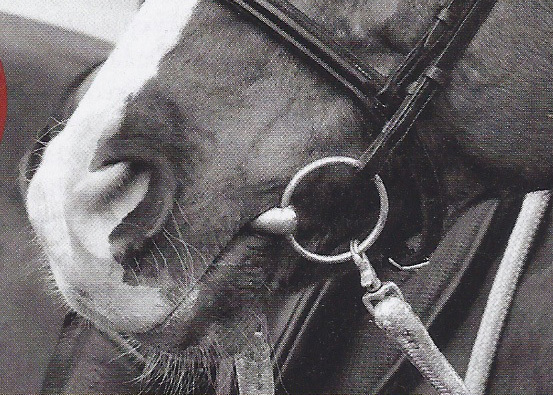 The metal bit in combination with the metal hook and the head of the horse produce the ‘tuning fork’ effect, meaning the metal on metal produces vibration that is then transmitted to a body. A tuning fork works by oscillating metal (hook and bit) and connecting it with a resonance box (horse’s head). While I don’t claim that you can tune your piano by aid of your poor horse’s head, the principle of the tuning fork clearly applies (here a Wikipedia article http://en.wikipedia.org/wiki/Tuning_fork). You can therefore imagine, that Dr. Schacht has a point when he claims that metal snap-hooks on reins, attached to metal bits produce oscillation that can potentially be extremely annoying or even painful to your horse. Head tossing, teeth grinding, tension in the poll, going against the bit, general flightiness/spookiness, unpredictable behaviors, etc. can all have their origin in or be aggravated by this tuning fork effect. But, but…it was sooo practical. Where to go from here? No harm done! 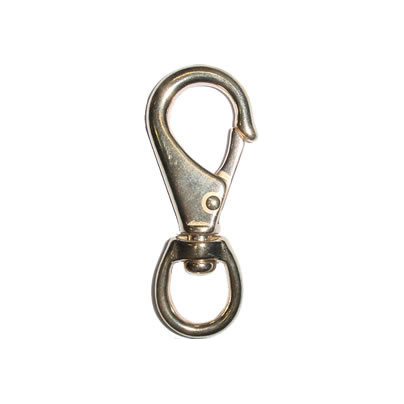 A snap-hook in combination with a leather snaffle. If the snap-hooks have become an indispensable item for your equine activity of choice, do your horse a favor and use a rubber or leather bit. This will prevent the oscillation from transferring to your horse’s head. If you like your metal bit, do your horse the favor of removing the snap-hooks and switch to a leather or rope connection (the old fashioned way…). You may see some immediate improvement in the way your horse responds or a change in behavior/temperament. you can also add little leather strips with a hole on each end, create a loop around your bit ring and snap the snap to the leather, and not the metal ring! My husband is an endurance rider and every endurance rider that I have seen uses these snaps on their reins so they can easily unsnap and use the reins as a lead. I would love to figure out another answer to this much needed piece of equipment as I have wondered if it was in fact causing discomfort for the horse. 25-100 miles is a long way to ride causing your horse discomfort. Linda, thanks for your comment. The ‘quick fix’ is good old duct tape. Does not look pretty, but will stop metal from rubbing on metal. Just wrap a little duct or electrical tape around the bit rings. Such a timely article…My riding coach suggested I take off my snap-end rope reins ( love them) because they were heavier than leather. I did and noticed a difference. And now, taking intto consideration the resonance factor, wow! So I am considering getting some leather or biothane rein ends like the ones in this pic:attach the strap to the bit and the snap rein to the end of the rein end. The reins in the pic are can be seen at: http://www.kudastore.com. , Horse Tack…/Paso Fino…/Reins and scroll down.